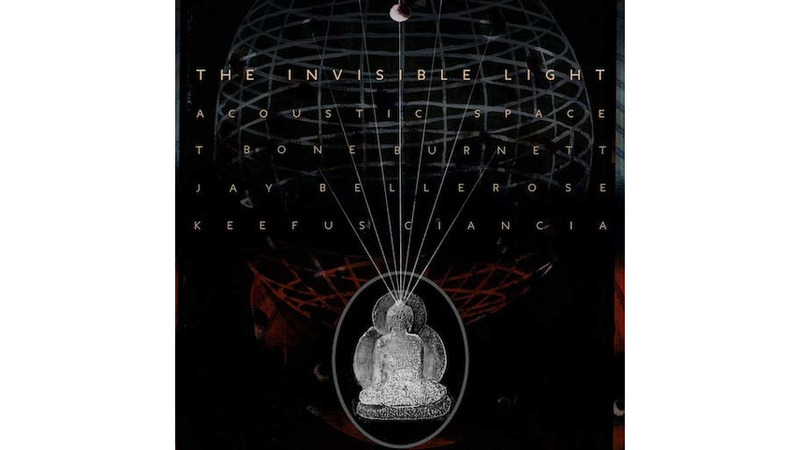 The Invisible Light: Acoustic Space, the latest addition to T Bone Burnett’s solo discography after an 11 year gap, comprises a handful of tracks that sound long-buried and freshly unearthed instead of brand-spanking new. That’s okay. The new can sound ancient if it likes, or if it makes sense, and Invisible Light has the aural quality of a relic tucked away in a cavern deep beneath the earth, waiting to be discovered by future generations, warning them of disasters and embarrassments they maybe could’ve avoided if they’d just dug the damn thing up a few years sooner. But Burnett, having busied himself producing and composing music for films and TV series ranging from Nashville to Inside Llewyn Davis to A Place at the Table for the last decade and change, has awakened, and if we’re too late to stop the political tragedies that have befallen us in the intervening years, at least we can rely on his sage counsel for succor. Granted, that means first hearing his lamentations. “I had thought the world would have been further along by now,” he opines about two minutes into the record’s second track, “A Man Without a Country,” mourning for the planet while ticking off a litany of varied disappointments. The world is cruel, and wrong, and ungrateful; we’ve become a pack of desensitized criminal saboteurs. He has the “desensitized” part right on the money. 2019 revolves around a news cycle that’s kept many Americans numb since 2016. Burnett declines to mention by name a certain entitled titian tyrant throwing temper tantrums in the White House, but he doesn’t need to, and frankly he shouldn’t anyway: The woes weighing down humanity the globe over tally to more than just the American president and his reign of cataclysmic ignorance. Burnett’s listeners know what kind of awfulness he’s talking about without him needing to specify. But hearing that broad message delivered in booming, thunderous tones, one part electronic, one part bluesy, another part still international in aesthetic, invokes an unexpected, humbling shame. Neither Burnett nor Invisible Light mean to make the audience feel guilty, or blamed. All the same the ominous, echoing rumble that defines the album’s character will likely fill more than a few people a powerful need to genuflect and beg absolution for man’s heinous crimes against man. Attending Burnett’s missives, otherworldly and displeased as they might appear at first blush, is like taking a scolding from God but with better production values. Not that Invisible Light is entirely a feel-bad album. It’s just that marrying lyrics rife with discontent over the state of humanity to music that bridges Saul Williams’ “Ohm” and Buddy Guy’s “Baby Please Don’t Leave Me,” naturally invites the kind of bad feeling that makes the blues such an enduring musical discipline. And as consolation, not every track on the album presents that sonic model; just most of them. “Acoustic space” is something of a sleight of hand. Read that phrase, you might expect a record defined by strums on an acoustic guitar, perhaps even a hollow body. Instead, reverberations abound, which goes right back to the image of the cavern, where sound bounces around off walls and ceiling. There’s a bemusing effect to the double meaning, a sense of geological scale offset by an unexpected intimacy. At the same time, Invisible Light is split up by “Anti Cyclone,” which ditches the trance vibe for global folk, excepting use of what sounds like distorted accordions as a background element. More significantly,“Anti Cyclone” ditches despondency for straightforward melancholy. “If you tell people things they already believe / they will believe you,” Burnett hums. “It doesn’t matter that you don’t believe a word you say.” What remains is the political critique; maybe the song’s more personal in nature, but it’s easy to interpret, maybe mistake, its meaning as rebuke toward lying, deceitful politicians and fascist thought leaders. Seems like swapping style doesn’t push Burnett away from the main thrust of his material. He has a purpose driving him on Invisible Light, and it hews toward the apocalyptic. He has hope, too, wrapped up primarily in “Being There,” but it’s a small hope. “Be not afraid / be not afraid / the angel begged / be not afraid,” he sings. The sentiment, while welcome, isn’t exactly a comfort when people in society aren’t there even when they are there, a reality Burnett details throughout the rest of the track. Maybe not being afraid is enough. Maybe being there is enough. Maybe Burnett’s advisements have come too late. If so, they’re at least a marvel to listen to.